While approaching the city of Agrigento (not far from our Sciacca villa rentals), located on a hill where the ancient Girgenti was founded by the Greeks around 580 b.C. and became one of the most important protagonists of the history of Greek and Roman dominations in Sicily, a series of ancient and extraordinarily well-preserved monuments can be spotted within a wide valley: it’s the magnificent Valley of the Temples, with its marvellous multitude of doric temples whose beauty and value are so huge that the Valley has been listed among the UNESCO World Heritage Sites back in 1997, and is nowadays one of the most visited and appreciated landmarks of Sicily. Ten temples, three sanctuaries, two “agorà”, a number of necropolis, a Roman settlement, fortifications and other impressive evidence of the ancient splendor of the site. The most well-preserved temple is the Temple of Concordia, built in the 5th Century b.C., while the most ancient one is the Temple of Heracles, of which eight columns are still intact. A considerably big pyramidal tomb made of tuff is also found in the site: it’s the “Tomb of Theron”, probably a memorial tribute to the Roman soldiers killed during the II Punic War. A visit to this site is an unforgettable experience indeed; however, we recommend you bear in mind that there are no shady areas within the site, and temperatures get quite high from June to September. To avoid hot weather, you can take advantage of the night opening of the site during Summer: watching the sun going down in front of the Valley and then staring at the fascinating show of the night lighting system of the site is an incredibly memorable experience. If you want to stay within a short distance from the archaeological park you can book one of our villas in Sicily near the Vally of the Temples. 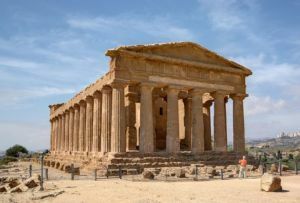 The Temples were built in the area of the ancient Akragas, the originary settlement of the city of Agrigento, whose city centre is still nowadays studded with charming monuments. Plenty of the gates built during the Middle Ages are still appreciable nowadays: the most important one was Porta di Ponte, dating back to the XI Century but rebuilt during the XIXth in Neo-classical style, the entrance to Via Atenea, once the most important axe of ancient Girgenti and nowadays a perfect destination for a stroll. Remains of the old city can be observed in the archaeological museum, while remarkable baroque buildings include the Cathedral and the Church of Santa Maria dei Greci, built upon a Greek temple.